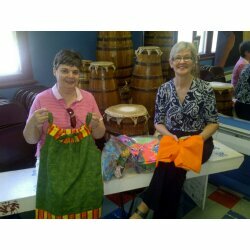 Former Board member, drummer and Baobab supporter Janet Quirt and her friend Karole Kidd-Witiuk dropped into the studio this morning with more than 50 items of handmade clothing for us to take to Ghana for kids in need. These colourful shorts and very cute dresses will surely be a hit. Thanks to both of them for all their hours of sewing time and generosity!